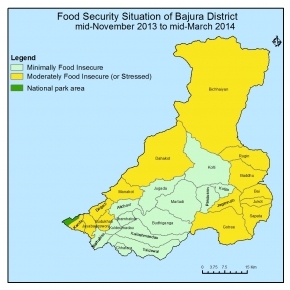 Overall food security situation is minimally food insecured in the district. in reporting period althought situation was moderatly insecured in estern nourthren part of the district in July- Augest month due to lean period for crop harvest but now situation is normal because of Production of Summer Crop ( paddy,Maize,Millet,Chino )was increase by up to 5% compare to normal year all over the define A ,B cluster, now people have HHs food stock sufficient for more than 4 month, also sufficient food stock in market and NFC no natural Diaster, no Human epedemic and peacefull civil security , as well market price also normal compare to last year in fllow of people during festival period_Dashain Tihar CA election with remittance inflow in the period. so finally 80% population are now minimally food insecured as well 20% population are sufferingmoderatly and highly food insecure situation. Overall food security situation will deteriorate due to lean period for crop harvest in upcoming cycle. Household food stock is depleting, wage employment opportunities will be limited due to less presence of development agency for support of food security. Market price of rice will be in increasing, So households will cope by borrowing food and money.